The Wessex Branch is lucky enough to have two members called Chris Phillips. One lives in Swanage, the other on the Isle of Wight. Here they are standing next to each other aboard Waverley last week with Wessex Branch Chairman Chris Warren on the right. All three, as well as other members of the Wessex Branch, work hard to help support Waverley when she is down south and drum up extra business with Isle of Wight Chris Phillips's talks to Probus clubs having passed into legend. All this work is very much appreciated. Not Yet a PSPS Member? Join us today and help us support our two Paddle Steamers - Waverley and Kingswear Castle. 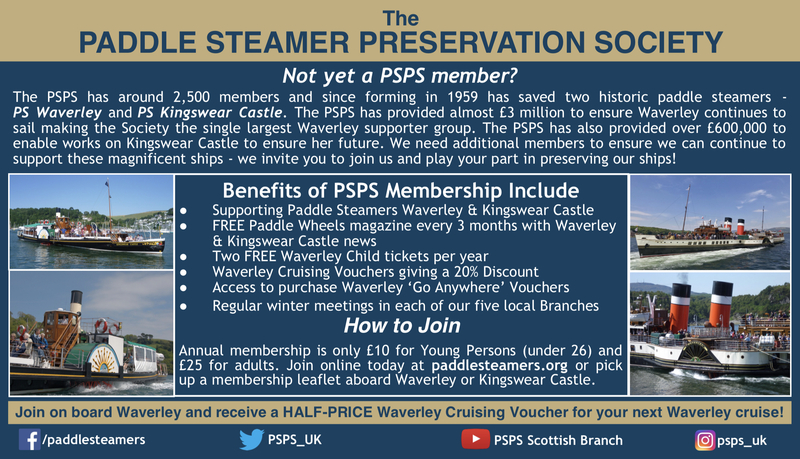 In addition PSPS members gain access to exclusive benefits including our full colour magazine, 'Paddle Wheels', every three months in addition to gaining access to discount tickets for Waverley and Kingswear Castle. Membership starts from only £10 per year. For full details and to join on-line today go to www.paddlesteamers.org/join. Waverley Excursions Ltd. has kindly offered concessions for Waverley sailings to PSPS members. Read more here. The Society is a company limited by guarantee (having no share capital), registered in England and Wales No. 2167853, and a charity registered in England and Wales (298328) and in Scotland (SC037603). Registered Office Mayfield, Hoe Lane, Abinger Hammer, Dorking, RH5 6RS. The Society is governed by its Articles of Association which set out its objects which may be summarised as to preserve in operation paddle steamers, to educate the public in their historical significance and to preserve relics and other materials associated with paddle steamers. Copyright © 2019 Paddle Steamer Preservation Society except where noted.